Lots of windows overlooking the beach Wow, what a fantastic view View as you enter the condo Newly remodeled kitchen with granite counter top and tile backsplash Fully equipped kitchen Dining area with bay window overlooking the ocean. Master bedroom with king size bed. Wall mounted flat screen TV in the master bedroom Brand new master bathroom New tiled master shower with glass doors Second bedroom with queen size bed. Second bedroom Third bedroom with bunk beds - twin and full size Third bedroom Hall bathroom Hall bathroom with new tile surround. Full size washer and dryer Welcome to the beach Nice wide beach with plenty of white sand We are the top floor, left side condo. 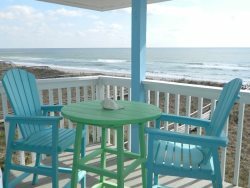 For a truly great beach experience, come stay at our oceanfront condo on Carolina Beach. You'll walk in and say "Wow" once you see what we've done. And when you notice all the windows and sliders we have overlooking the ocean, you'll understand why we think this is the best condo on the whole island. The views are amazing! This is a third floor (top floor) condo with expansive views of the whole beach. We have three bedroom, 2 full baths, a large ocean side deck, a balcony off the master bedroom facing the inlet, and another balcony off the second bedroom looking out toward the ocean. The living room has a huge wall mounted flat screen TV and master has a large flat screen wall mounted TV too. in the living room. We have Wifi, a DVD player, DVD's, games, and books for you to enjoy. The master bedroom has a king bed, the second bedroom has a queen bed, and the third bedroom has bunk beds - twin on top and full size bed below. It also has a new pull out queen size sleeper sofa in the living room. We are a little island but with lots of fun things to do: the NC Aquarium, Fort Fisher Civil War museum, our famous boardwalk, two fishing piers, Britts Donuts (an institution since 1939), Squiglie's Ice Cram Shop, and Freeman Park - where you can drive out and camp right on the beach. We offer free live bands, carnival rides, and fireworks during the summer and of course have some delicious seafood restaurants. What more could you want! You can book your reservation right from our website or if you prefer, give us a call and we'll be glad to help. (910)-409-6687. Our ocean front condo comes with everything you'll need except your food and drink. Please let us now if you require anything else, we'll be glad to help you out! Everyone was very helpful and courteous! I love so many things about Mimis place: location, decor, view, comfy beds, well-stocked kitchen, games to play, and lots of other things! The A1 Property Management team was extremely responsive, helpful and professional. The gorgeous panoramic ocean views from every room. The unit was comfortable and well-equipped.The location was close to the boardwalk, stores and attractions. I enjoyed every single moment of my vacation and will not hesitate to reserve a future vacation with the A1 Property Management team. Super quick replies to all emails and helpful answers. Super quick to respond to the ant issue in the property upon arrival too. We really appreciated this! Great location, amazing views and helpful extras at property like bathroom tissue, detergent, dishwasher tablets, hairdryer. Even coffee pods (we had brought our own, but this was a very thoughtful addition!). The condo was decorated nicely, with lots of seating for everyone inside and on the balcony. Liked the folder of info about local places to visit, restaurant menus etc. We didn't try any of the electronics, so can't comment on them, but they certainly looked good! The close access to the beach was amazing. Kids loved the bunk beds! Comfy mattresses! Everyone was personable, professional, prompt, and polite. We appreciated the detailed information regarding our rental and the updates/reminders as our time came closer. The property was clean, neat, well maintained, and true to the posted pictures. We loved the location and beautiful views from our balcony. The space configuration was ample. Communication was quick, polite, and helpful! The views were stunning, and the updated condo made us feel more comfortable and at home. spectacular view beautifully decorated well stocked kitchen items My family enjoyed our stay at this condo very much. Loved the beautiful condo and our time here. Celebrated my 62nd birthday with my children. The weather was great too. Britt's wasn't open yet for the season but we got fabulous birthday treats at Big Apple Bakery. We'd love to wake up to this view everyday! Great time, great place! Beautiful condo! We all loved the view and the short walk to the beach! So many great restaurants and things to do on Carolina Beach! Thanks for letting us stay! Thank you so much for sharing your beautiful home with us. The decor is lovely and chic and the view is simply magnificent. We were in need of a little respite and we certainly feel renewed now. We will look forward to returning to Mimi's Place! Thank you for sharing your beautiful view with us. This place is very cozy and warm. Waking up to watch the sunrise was perfect! This was such an awesome vacation! The location was amazing! We loved starting the day with coffee on the balcony looking out at the ocean! The Britts donuts might have made it even better! The Condo was perfect for our family of 6! It was nice and clean and spacious. We were not disappointed at all!! If you are looking for the perfect vacation home this is it!! We had a wonderful time, the accommodations were perfect for a family of 6. Thanks for making sure everything was clean and comfortable! Our stay at Unit F was really nice - better than any Beachfront place that we've stayed at over the dozen or so years vacationing at Carolina Beach. The views are second to none, and everything being brand new made the stay even more enjoyable. 2 car Parking was fine. Highly recommended - We'll be back!